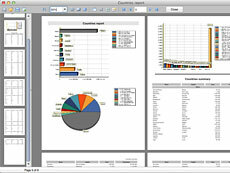 Multiplatform Report Generator for Apple Mac OC X and Microsoft Windows, Compatible with Embarcadero RAD Studio XE2 (FMX library).Report generator FastReport FMX is the first multiplatform solution for including Business Intelligence into software based on Embarcadero FireMonkey IDE (Delphi for MS Windows and Apple Mac OS X). Now you can create business applications for Apple Mac OS X users also. You are getting powerful tool for your business applications which allows create documents and send them to print under popular operating systems on PC. 独立的选项卡，"report design", "data" 和 "code". Multi platform Report Generator for Apple Mac OS X and Microsoft Windows, compatible with Embarcadero RAD Studio XE (FMX library). Report generator FastReport FMX is the first multi-platform solution which integrates Business Intelligence into software based on the Embarcadero FireMonkey IDE (Delphi for MS Windows and Apple Mac OS X).